Bulbmeister.COM offers common and not-so-common flower bulbs. The nursery branch specializes in the mid-summer to fall blooming genus, Lycoris, commonly know as spider, surprise, resurrection, or hurricane lily. A very large selection of imported dormant spring and fall bulbs are also offered. VISA, MC, Amex, Discover, Paypal, Check or Money order are all accepted via our secured online order form. Sometimes, an electronic Adobe Acrobat version of the bulb list is available for download. September 13, 2014 My first order from Bulbmeister and was pleasantly pleased with them all around. Nice website, great communication, shipping and very health plants were received. Would order from Kelly again. November 2, 2013 I was looking for cannas that can survive zone 6 outside. 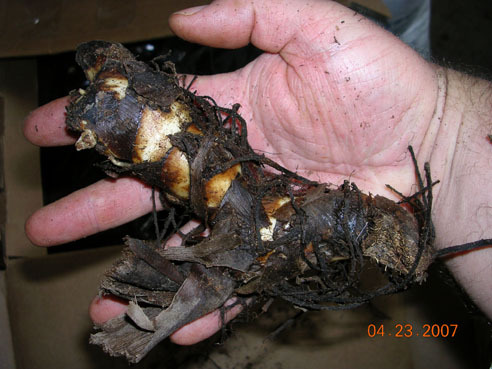 I ended purchasing a canna rhizome from this seller last month (Oct 2013) and I was very happy with it. 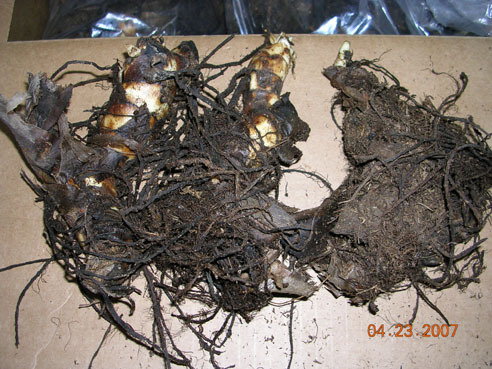 The sale was for 1 rhizome, but i received two fresh big plump fat juicy rhizomes instead. Shipping was fast. Very well packed. Big box. Very generous seller. Thank you sooo much. So one rhizome I planted outside with thick layer of mulch, and one I'm saving to plant in spring juuuust in case the one in the ground doesn't make it. March 31, 2012 My experience with Bulbmeister.com has been more than positive; I rate it AAA! I am happy to report having received the seven Lycoris squamigera bulbs I ordered a short while earlier. The Priority Mail package that arrived was stunningly pristine clean; the paperwork including a copy of my invoice, a kindly written "thank you" letter and explicit planting instructions were carefully folded and added to the top of the package contents. Below the paperwork I discovered clean pink colored polyureathane packing peanuts that closely caressed the separately bagged bulbs. Their healthy root systems were kept moist in sphagnum peat moss wrapped & individually labeled with TLC and perfection. They were immediately planted, fertilized and watered with care and great anticipation of their blooming maturity. It's been a long time dream of mine and desire to have this "Naked Lady Lily" as part of my garden. I plan to set out some white Candy Tuft or sow white Alyssum above the planted bulbs to provide a contrast for this beautiful flower. Thank you Kelly! I was greatly honored by your personal e-mail comment that my bulbs were the first to be dug up from your garden this season. If I ever have the opportunity to travel to Gravette, AR area I would be pleased to visit your gardens. I look forward to continue placing my gardening needs with your business at Bulbmeister.com. Again, thank you! September 2, 2011 My first order with bulbmeister and I'm very happy with them.I ordered one each of Lycoris chinensis,haywardii and longituba, bulbs look nice and healthy.Everything was well packed and arrived quickly. Can't wait to order again. October 8, 2008 My order of bulbs arrived in excellent condition at the appropriate time for fall planting. I received an e-mail notice that it had been shipped and when to watch for its arrival. August 13, 2007 I have place half a dozen orders with Bulbmeister over the past few years and have been very happy with the customer service and materials received. Some folks who do ratings here don't seem to take into consideration total value, that is quality in light of pricing, when they make some of their comments. You always get about what you pay for with Kelly. I have received some small bulbs from bulbmeister, but they have always been a good deal for the price. Occasionally, I get way more than I've paid for, e.g. this year I purchased a Crinoid from Bulbmeister for just under six dollars and received a bulb that was nearly 4 inches in diameter! Bulbmeister does have some problems with some of it's suppliers coming through with materials that have been included in the catalog, but Bulbmeister has always honored volume discounts even if the part of the order they were unable to fulfill dropped the total order below the volume discount amount. I understand that this is being remedied by having a "wish list" section for bulbs that are in short supply or are not reliably available. Bottom line is that Bulbmeister provides some of the best total value of any of the web-based nurseries I've purchased from. June 24, 2007 Time has passed since my Spring and Early summer plantings, and I can now pass on comments about the venders from which I ordered. I must say that I am very pleased in all respects with the product and services received from this company. I received excellent prior notification of my bulbs, so there was no surprise when they arrived. Every bulb was well packed and labled. Planting instructions were easy to obtain and print from the website. Some of the bulbs appeared small, but I will admit that I am not an expert on many of the more obscure varieties I ordered, so I will not automatically assume that they were of poor quality (as it would appear some do here at Dave's). The important thing is that almost 100% have done well and are growing healthily now in my garden. I cannot comment on how well this vendor might resolve a negative situation since I have no problem w/ what I have experienced thus far. I do wonder why the person that has listed the one negative comment here has not tried to invoke the "110% guarentee." I would like to hear if it works. Certainly if I were to ever receive back more than I spent, I would at least change my rating to a neutral, despite any disappointment. I think it unique that in the vendor's apology the words "I was a fool" appear. That is not one I have seen too often. Anyway, I have now placed my Fall order with great confidence as well as expectation. Thank you and have a good day! April 24, 2007 When what I ordered was unavailable, I was notified as quickly as possible, and refunded immediately. I really appreciated that. I was thrilled that most of the cannas I ordered were in, and arrived in very nice shape. I hope to update the progress as time goes on. The Achimenes I ordered were HUGE, especially for Achimenes, and most were already sprouting. For the price, everything was especially great! April 24, 2007 Ordered Liatris and they were definitely priced right. They say you get what you pay for, but the bulbs arrived today and they're great, most already sprouting. They were packed carefully but efficiently with a minimum of plastic and paper waste, which I always appreciate. They arrived quickly but I never received a shipping notice or order confirmation via email; this could be my husband's overly-enthusiastic spam filters, though, I suppose. Shipping was a little pricey, but the package was heavy for its size, and with shipping the bulbs still came out to a better deal than I could get elsewhere (a local nursery would charge $10 for a gallon pot containing probably 5 bulbs maximum). April 23, 2007 I just received my order from this company and was terribly disappointed. The six Pretoria canna tubers were all extremely small and most certainly dead! They were dried out and black. How these would grow strains credulity to the hilt! The three Journey's End canna tubers were passable, but nowhere near the quality of another company from whom I have ordered in the past. Moreover, I was notified that the Akita Dahlia tubers I ordered back in February were not available. I am now grateful they were not included in the order. It reduces my loss. I have ordered from various companies for over thirty-five years and have never been so thoroughly disgusted. Thank you for your feedback. I surely do wish you had attempted to resolve this issue with me. You actually had 3 dahlia varieties in your order, and I was unable to deliver any of them. Maybe that is the real reason you are so angry. It was my first season to offer so many Dahlia, and my supplier just ran out early. I did acquire a few dozen different varieties nonetheless, still available at the site, and mostly quite large. Concerning the 'Pretoria', I have no more left to offer example or replacement. They were small, but then that variety can be, and they were only advertised as flowering sized. They, like a few of my other Canna rhizomes originate overseas, and do sometimes come over a bit dessicated. If I passed on to you dead rhizomes, I was a fool, and it was in no way intentional. You could have always taken advantage, and still can, of the 110% refund policy. Concerning the Canna I marketed from my Texas source (all of them), what may be "passable" to some, look to me like a neighbor just finished digging them up in her yard and brought them over to me for planting. The referenced links are pictures I just took this evening of 'Journey's End'. You will have to take my word for it, I guess, but the rhizomes are anywhere from 3/4"-1 1/2" thick with several eyes and could be no more turgid. Thanks for your kind consideration and support of small business in America. changing my rating from neutral to positive.. I thought I'd scale these bulbs, since they didn't seem like much and I thought if I messed it up, it wouldn't be that big of a deal. Well, the bulbs must have been healthy because I now have tons of babies. I was too quick to judge, and spoiled by the size of other companies bulbs. Evidently size is not all!! December 10, 2006 The bulbs came as ordered. Planting intsructions were not included or on the webpage which I thought was odd. Thank you for your positive feedback. I just want to shed light on the fact that some planting instructions are available through the side bar link, "Growing Guide", at my website. I certainly wish it was more comprehensive, but I hope to make it so as time goes by. November 29, 2006 i have ordered from kelly several times over the past 5 years. very helpful. can't ask for better. 5 star !! November 24, 2006 i ordered 3 little lycoris bulbs..........all of them were already doubling and one was a tripling! i like this company. the only thing i regret is that i found them so late in the season. kelly communicates at every turn just keeping you informed of every facet of the transaction. thanks bulbmeister. November 15, 2006 On Oct 30 2006, I placed a sale order ( DG members got 15% off plus another 5% for quantity discount) with Bulbmeister . November 3, 2006 I just got my bulbs, and everything looks to be in order. Now I just have to plant everything! May 22, 2005 Probably the best bulbs I've ever received by mail. They couldn't be better if I had picked and chosen them myself locally. In addition, the Website offers an extensive variety, and at highly reasonable prices. August 29, 2004 I have ordered from the Bulbmeister twice. They have unusual plants and good prices. Kelly answers email quickly. November 15, 2003 I placed an order from the November 50% off list. (Like I need more bulbs...). The bulbs were received quickly, and are of good quality. I was pleased enough to place a second end-of-season order (Like I needed more more bulbs?). Little pointy things everywhere! (Mostly tulips-to-bloom). In the harsh conditions in my front yard (xeric/desert), things have to be healthy to survive, and these bulbs are thriving. November 11, 2003 Nice bulbs, received discount for end of the season sale, very pleased with them, will order again. October 14, 2003 I was excited about my "yellow spider lilies". I ordered from bulbmaster and he shipped them right away.They were dormant bulbs in the best of condition. I put the bulbs right in the ground and I was surprised two months later they flowered!! I will buy from him again! July 31, 2003 I bought bulbs from them twice before.They arrived in very good shape,they put even larger amount that was promissed on-line.Kelly respond quick and properly on all e-mails. I purchased from them again.I`m pretty sure will continue doing business in the future. I`ve ordered from them twice more.Wonderful service! fresh rare bulbs,almost all the time there are some extras in bags,good packing.A little bit high on shipping,but prices are cheap enough and bulbs are so fresh and rare ,that I still like to order from them.Always get proper replies from an owner,great offers. will be doing business with them again. July 1, 2003 I love bulbmeister.com! I'm in Southern California, so it is great to find a place with such a wide variety of warm climate bulbs. Thier quality is superb and prices are more than fair. If your looking for something a little different, this is the place. April 4, 2003 Bulbmeister has great service! My crocosmia bulbs arrived on schedule and are exactly what I was looking for. September 11, 2002 Kelly answers email very promptly. The lycoris and zephyranthes I ordered arrived in terrific shape (it didn't hurt at all that they'd only been dug two days before I got them). I already have another order placed with him. July 23, 2002 Great service--very prompt. Beautiful healthy bulbs. Great price. July 22, 2002 This guy knows his stuff--Masters in Horticulture and years of experience. Ships complete, quick and fresh. Definitely a good source. I would do business again for sure.